CURT 5th wheel hitches are in a category of their own, giving new definition to the concept of heavy-duty towing. With their superior strength and gentle ride, 5th wheel hitches are intended for towing heavy loads and, more specifically, the bulky size of 5th wheel trailers. 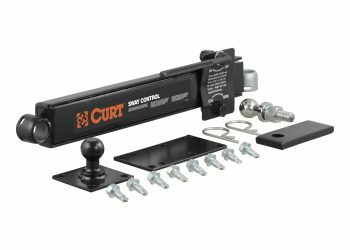 At CURT, we recognize the need for quality 5th wheel towing products and the fact that the most common use for fifth wheel hitches is RV towing. As such, we have designed our 5th wheel trailer hitches to be the perfect balance of towing power and versatility, to give you that ultimate RV experience, weekend after weekend. 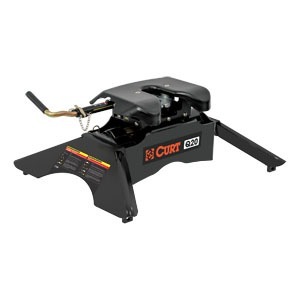 CURT 5th wheel hitches function much like the coupling mechanism of a semi truck or 18-wheeler. Unlike our receiver hitches that provide a tube to accept a ball mount shank, our 5th wheels place the coupler on the vehicle side and are designed to accept the kingpin of a fifth wheel trailer. 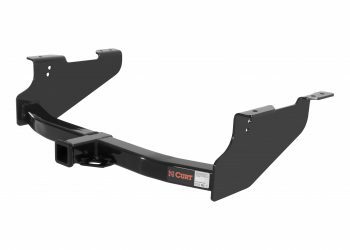 CURT 5th wheel hitches are engineered to mount into the bed of a pickup truck using a 5th wheel bracket kit and base rails or a gooseneck adapter. Our 5th wheels are available with Ford OEM legs, Ram OEM legs, basic 5th wheel legs and rails, a 5th wheel roller unit or simply as a standalone hitch head. CURT’s 16,000-lb. capacity 5th wheel hitches are divided into two categories: the A16 (formerly the Q16) and the E16. Within the strong steel hitch body of the A16 is a cast metal cradle yoke that pivots on two axes. This allows it to move freely with the 5th wheel trailer and kingpin while maintaining superior towing strength. It also makes the A16’s movements extremely quiet. The A16 also has a series of poly torsion inserts that suppress shock loads and reduce noise. The CURT Q-series is a new breed of 5th wheel hitches that sets the bar higher, bringing better quality and fresh innovation to the towing world. 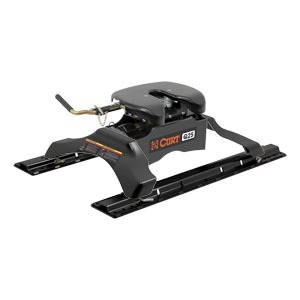 As a member of the CURT Q-series, the Q20 5th wheel hitch is no exception. It is marked for its strength of design and towing finesse, rating in as one of the quietest fifth wheel hitches on the market. The Q20 is a perfect balance of power and control. It features a gross trailer weight capacity of up to 20,000 lbs. and can bear a vertical load limit of 5,000 lbs. 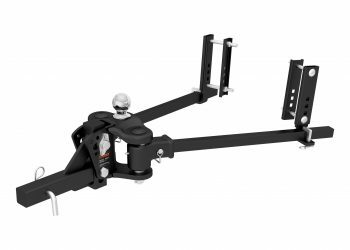 It also has a set of dual-locking jaws, positioned within the hitch head to fully and firmly grasp the kingpin of your 5th wheel trailer and keep it locked in tight as you drive to your next destination. Wherever you tow your 5th wheel trailer, if finding that open road is a way of life for you, you need a 5th wheel hitch that is strong like the Rocky Mountains, smooth like the rolling hills of Iowa and quiet like the South Dakota Badlands. 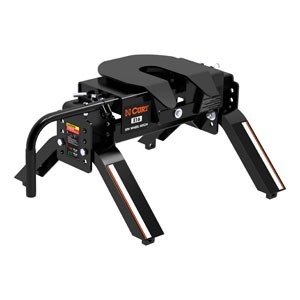 With its spherical axial bearing, dual-locking jaws and high-strength steel construction, the CURT Q25 5th wheel hitch gives you superior towing power and a supremely quiet ride. As the newest member of the CURT Q-series, the Q25 excels in quiet towing. The defining component of this 25K 5th wheel hitch is its unique pivoting mechanism, a spherical axial bearing. This highly sophisticated technology offers free movement to allow the Q25 5th wheel head to tilt in virtually any direction. Once coupled to the kingpin, the head pivots and angles with your 5th wheel trailer, making turns smoother, dips easier and bumps gentler. The head also uses a pair of dual-locking jaws to completely wrap the kingpin on all sides and ensure a secure vehicle-trailer connection. To make the Q25 even quieter, it also comes with three grease fittings and a polyethylene lube plate for optimum lubrication.